Bohol is known as the City of Peace and Friendship. It is an island province located at the southern part of the Visayas island chain and is known for not only a very unique species of primate but also for a trademark that is known world -wide as a UNESCO world heritage site. Even after the devastation that hit Bohol, an earthquake with the magnitude of 7.2 many tourists still visit Bohol to this day. Bohol has taken great measures and has a polished confident stature far superior to it’s previous years, denouncing the theories that Bohol would be in a “state of tragedy”. It has actually uplifted itself using “affected sites’ as a product for it’s tourism. Thankfully though many sites were not affected and are being taken care of in a manner where they are being taken into deep concern, so if you would still like to see the unique and “picture perfect” Chocolate Hills of Bohol, you still have the chance! Now let’s talk about animals, well, primates to be more specific. We’ve all heard that “bigger is better” but what about “smaller is special?” Take a chance to visit a primate that is amazingly “odd”, a primate that FITS IN THE PALM OF YOUR HAND! 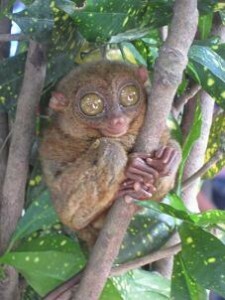 The Philippine Tarsiers! Even if it is not the smallest primate or a marsupial it is still quite uncommon for a primate to be hand-sized but please note that Tarsiers are nocturnal, so bright camera flashes or any actions that can startle them are not advised. Another factor to consider in Bohol besides the spiritual or religious side is the leisure and relaxing activities to attend, yes I’m talking about the hype of the summer season worldwide! BEACHES AND RESORT! Bohol has a number of resorts and has many awe-stricken beaches with breath-taking scenery, so you, your lover, and even your kids can truly feel relaxed and vibrant with the wonder that is NATURE! 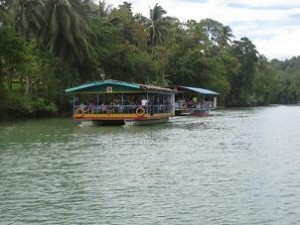 To add to the excitement of “activity in the water” why not take a relaxing trip down the Loboc River, on the “Loboc River Cruise” where not only are you swaying calmly on the river, but you can also be munching on something sumptuous, the boats used for the cruise are floating restaurants! How awesome is that? Well Loboc isn’t just for those with faint hearts, for Loboc Ecological Park offers you a chance to zip through the forests on either a zip line or a cable car! Now as you may recall, I mentioned a site – a geographical site that is known world-wide, and that is the CHOCOLATE HILLS of BOHOL! Just think! Over 1,200 giant Hershey Kisses shaped mounds in front of you! Now think if those giant chocolate like hills were under your feet! No longer just a picture on a screen, but a literal event that happened in your life, so you can quote on social media, “EATING CHOCOLATE ON THE CHOCOLATE HILLS!” Now that would be a laugh and all you have to do is visit them in Bohol! Exciting huh? Well that’s only some of the many exciting activities you can experience first hand! Making a memory you can truly be proud of either with yourself, your family, your significant other, or even your companions! It’s your choice! And to think we haven’t even covered the festivals and events, like Sandugo Festival! Imagine that! Festivals, island adventures like Loboc, beaches and resorts such as the Alona Beach on Panglao Island, conveniently all located in Bohol! All right, it’s time to stop teasing you, the future adventurer, I’ve set up my offer, given you an idea of the spectacular chance that awaits you, now go! Visit Bohol and see for yourself!